Deserts present photographers with problems, not only those of climate, but also of exposure due to the extreme sunlight - bright light and deep shadows. 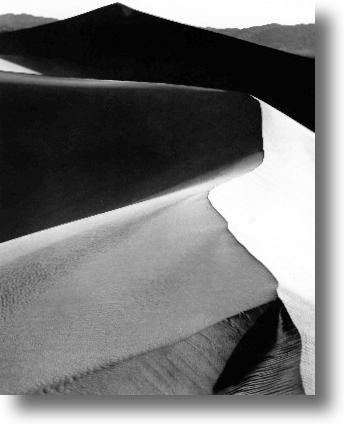 Adams learned from his friend and colleague, the photographer Edward Weston that the use of a strong yellow filter for black and white photography in Death Valley gave disappointing results. Instead of separating the earth tones from the sky tones as would normally be expected, the yellowish and reddish earth tones were in fact lightened and over-exposed. A better result was obtained by not using any filter at all. As a result Adams was able to obtain good results from his trips to Death Valley from the outset, unlike Weston who had learned the hard way by a number of failures from his initial forays to this region. Photographs of desert regions frequently give shadows that are simply large flat black areas with no detail whatsoever,this is not what is seen when present at the scene. With careful exposure and development of the negative, this detail in the shadow can be brought out. Camping on this occasion on top of his car on a 5 x 9 feet camera platform, rising in plenty of time for dawn and then trekking through the dunes, Adams was able on this occasion to get some good results. Previously on other occasions he had been too late for the sunrise, or had problems with wind-blown sand. It is the nature of sand dunes that they are continuously blown by the wind and shifting about, so a position once found can only be used for a short time. On a subsequent visit weeks or months later, the same vista will simply not be there. The picture was taken on a 4 x 5 in camera with a yellow filter which on this occasion separates out the fore-ground tones rather than darkening the sky appreciably. Very shortly after taking the pictures Adams returned to his car and out of the climbing temperatures on the dunes. He had also prepared for the occasion by painting his camera cases with white paint. Traditional camera cases are matt black, an experiment at home in San Francisco one mild sunny afternoon showed that white painted cases stayed very considerably cooler than the black equivalent.